We knew that hillside vineyards produced better wines so we searched for almost 15 years to find that unique terroir in Napa. 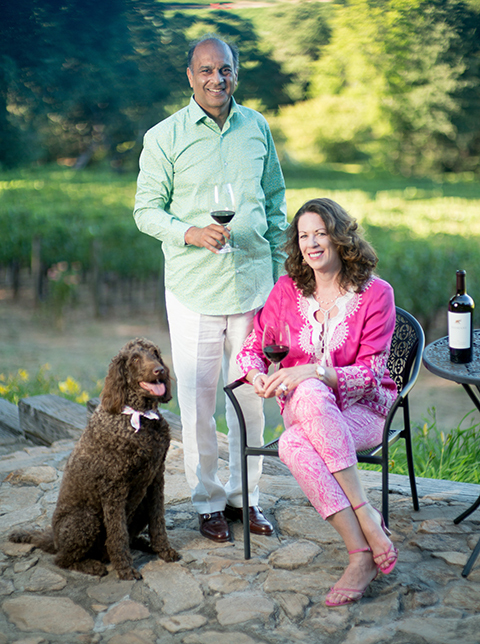 Everything Arvind and Beverly Sodhani do in the vineyard and during the winemaking process is in pursuit of delivering perfection in the bottle. When we moved to San Francisco from Europe, we discovered Napa had the potential to produce spectacular wines and become famous as a wine producing region on par with Bordeaux and Burgundy. From our visits to Burgundy, we knew that hillside vineyards produced better wines so we searched for almost 15 years to find that unique terroir in Napa. We finally found a gem of a vineyard with 6.5 acres of premium Cabernet planted by Jim Barbour in 2000 and then partnered with Thomas Rivers Brown to craft our wines…the rest is history. We have two very good friends that have influenced us: Naoko Dalla Valle and Jennifer Lamb. Both these ladies have endured challenges and have been successful in developing their brands through a lot of hard work. They also are very generous to the community with their time and resources. When a customer loves our wine and posts a fabulous review on a social media site, and then everyone wants to get an allocation. Or having customers send us photos of drinking our wine and thanking us for making such a unique Cab. Dealing with regulations; it is not easy as a small family vineyard to navigate the waters while trying to build your dream. We are committed to making the best Napa Cabernet Sauvignon wine. We make no compromises at any step of our winemaking efforts. Everything we do in the vineyard and during the winemaking process is in pursuit of delivering perfection in the bottle. From hand farming all year to selecting only the perfect grapes using the optical sorter to aging both the Reserve and the Estate wines in 100 percent new French oak barrels for 20 months. Weather! Every year is a great year in Napa until you have a difficult one. We are very fortunate to have consistently excellent years with little suffering. You have the opportunity to make a small fortune provided you start with a large one! All kidding aside, just like in real estate it is location, location, location. In Napa it’s all about terroir, terroir, terroir! Once you find the terroir, then find a winemaker who understands the terroir and doesn’t try to manipulate it into something it is not.